FROM the moment you step through the door into Casa Vista de Yates, you will feel the warm welcome of Mexico. Walk onto the patio surrounded by beautiful gardens, and overlook the new La Cruz Marina, the sailboats, fishermen, and beautiful Banderas Bay. At night enjoy the sparkling lights of Puerto Vallarta. OUR home is located in the small fishing village of La Cruz de Huanacaxtle, about 14 miles north of the Puerto Vallarta International Airport. Far enough away to escape the hustle and bustle of city life, it is still close enough to enjoy the nightlife, sightseeing and fun of the city. CASA Vista de Yates is a private, secure, 3 Bedroom completely furnished, traditional Mexican home for adults and families. It is beautifully appointed and suitable for the most discriminating guests. You can relax on the patio and swim in the blue tiled swimming pool, or walk 100 steps to the white sand beaches of La Cruz de Huanacaxtle. Casa Vista de Yates has tiled floors throughout and a complete kitchen with everything you might need to prepare gourmet meals. The water supply is equipped with a water purification and pressure system. Maid service is provided once a week with towels changed when needed. On the first floor of the Casa is the large master bedroom with tiled bath, king size bed and patio overlooking the ocean and marina. Also there is a spacious second bedroom with queen-size bed, double bunk with twin on top, and half bath looking out over the gardens. All bedrooms include foam mattress toppers and luxury linens for your sleeping comfort. The living area includes a dining area and living room with a TV with DVD. Up the tiled staircase, you will find another comfortable sitting area. The second master bedroom has a king size bed and beautiful traditionally tiled bath with a deck and breathtaking view of the new La Cruz Marina and Bay of Banderas. The Casa is walled and gated for your privacy and security. IT IS A PERFECT PLACE TO RELAX. HERE, along this mile stretch of beach, are several luxury homes - our Mexican paradise. 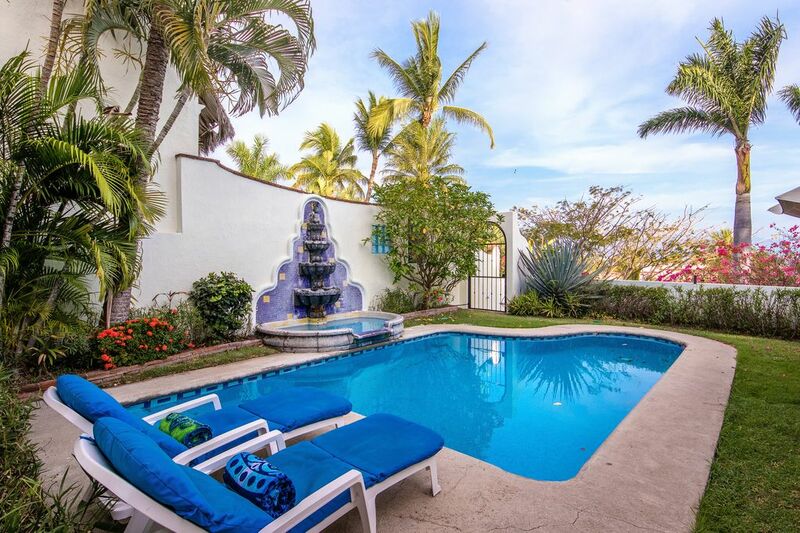 It is easily accessible by the main highway to Punta de Mita. Dennis and Adam, at Gecko Rent a Car in Bucerias will pick you up at the airport and deliver you and your car to our doorstep. In La Cruz you can enjoy the ambiance of a small Mexican village with small shops, traditional taco stands, wonderful bakeries, but also first class restaurants such as Frascati's Italian Restaurant, Black Forest Restaurant, Masala, and the new La Cruz Yacht Club Restaurant, and our favorite for tacos -- Tacos on the Street. Other favorites are Philos Pizza, Ana Banana's, Huanacaxtle Cafe and even Subway is on the Plaza. IF you do tire of the lazy days, we can easily arrange a variety of tours for you including: ATV Tour, Canopy Tour, Diving and Snorkeling Trips, Shopping, Swimming with the Dolphins, Fishing, Golfing and many more. The Puerto Vallarta area is alive with exciting things to do, day and night. WHAT more could you ask for? Perhaps someone to prepare a meal or two occasionally. We can arrange a traditional Mexican chef to come to the Casa and prepare a delicious meal for you at a reasonable cost. Also we have a massage therapist available who will come to the Casa and spoil and relax you with a therapeutic massage. The above services can easily be arranged by calling our local Property Manager. WE WELCOME YOU TO CASA VISTA DE YATES - OUR MEXICAN PARADISE! Your 'Home in La Cruz' owners are Charlie and Linda Higgins. We were born and raised in the Seattle, Washington area and have lived there our entire lives. We raised our family of 4 children in Seattle. We found on our numerous visits to Mexico that we loved the Puerto Vallarta area and we finally found our dream home in La Cruz. After our retirement, we bought Casa Vista de Yates so we could enjoy winters in the awesome Banderas Bay area and summers in beautiful Lake Chelan, WA, where we reside now. As soon as we walked through the doors of Casa Vista de Yates, we loved it. We love the traditional mexican architecture and ambiance. Looking out from the deck area we were entranced by the activities at the marina and the gorgeous view of the Bay of Banderas. We just can't believe that we can get up every morning and have coffee overlooking that wonderful view. The friendliness and quaint feeling of the village of La Cruz further convinced us that we should be here. The village of La Cruz is small and welcoming, AND it has some awesome places to eat and listen to music. There are always things to do and another beach to discover here. Staying at our property you will enjoy being RELAXED and REFRESHED. The large pool is beautiful to look at and refreshing to be in. Our back yard is relaxing with beautiful tropical gardens and flowers. The view is one of the best in the world. The town of La Cruz is welcoming and friendly with lots of great restaurants and bars with music from around the world. The local fishermen sell their fresh fish daily in the marina. There are people from all around the world here who sail into the marina and enjoy the ambiance of La Cruz. There are fantastic beaches in every direction. If you love fishing, its the place to be with boats available to take you deep see fishing for marlin,tuna, sailfish, mahi-mahi and more just steps from our house. We love it here -- Can you tell??? Each room has air conditioner. Dining room with room for 6 and outside dining area with room for 4. Smoking is allowed on the deck and balcony. Water Purification & Pressure System; Complete Laundry Facility for Guests, Beach Chairs/Umbrella; Housekeeper included once a week; Massage Therapist Available; Chef Available; All household amenities included -- ironing board/iron; blender; coffee maker; toaster; microwave;juicer ; hair dryer. Relaxing, five star clean, comfortable beds, refreshing pool, beach towels, beach umbrella and well appointed kitchen. Linda and Teresa immediately answered our questions. Cleaning, pool and landscape team did a great job during our stay. Villa is conveniently located to the fish market, Sunday market, marina and beaches. Wonderful vacation property, would definitely stay again. Thanks for your kind words Donna. We strive to make our home a relaxing and fun vacation home. Our property manager, Teresa and housekeeper, Claudia are the best!! We loved having you as our guest and hope to see you in the near future again! This is a really beautiful home with a wonderful view of the bay. We really had no problems...from meeting our host after arriving to turning the keys in a week later. It's well-appointed with good A/C, wifi and towels/linens. We spent a lot of time lounging in the pool and around the house. The town of La Cruz is very walkable and quaint with some good restaurant choices, local supplies (aguacates, salsa y tortillas) and friendly locals. Our favorite was Xoklo just across the main road. Once you get the lay of the land, it's easy to get around via taxi, collectivo or bus and get supplies in Bucerias (15 min) or make trips to Vallarta or Sayulita. It was also super convenient to walk to the marina and two lovely beaches (sunset swims were epic!). We were also able to walk right to our snorkel tour boat with Chica Locca which was super convenient and amazing. We would love to visit again! We had a great stay and highly recommend to anyone. We just returned from Casa Vista de Yates and want to say that it was absolutely amazing. We were fortunate to be able to stay for 28 days in this lovely casa. It had everything we needed to prepare our own meals, a huge refrigerator and the beds were SO comfortable!! Having our own pool was perfect. We were in and around it everyday. A huge "thank you" to Claudia, the young woman who cleaned the casa each week. She was so sweet and did an amazing job...............and given the size of the casa was not an easy task! We enjoyed several restaurants in La Cruz and they did not disappoint - Glorieta's, Oso's, LaCruz Inn, Green Tomate, Little Hot Grill, Ramones and Falconi's. The farmers markets on Sundays are a must. There is one at the Marina and another at the town square. Both offer local foods, Mexican crafts and clothes. Linda, thank you very much for all you did to make our trip so enjoyable. We loved your casa and felt very "at home" there. Puerto Vallarta is alive with activities such as: Romantic evening cruises, Canopy Tours, ATV Tours, Swimming with the Dolphins and Seals; Boat trip to Las Caletas, Sightseeing trips to Historic Cities; Deep Sea Fishing; Spa Treatments. Please contact owner for specials and one or two week rentals during the Christmas holiday. Note: All rates are subject to change without notice.